Three Coins in the Fountain. 20th Century Fox 1954. This is one of those movies that seem to boil down to a log line and nothing more enters the general consciousness. This is three romances centered wishes at Trevi Fountain. I know nothing more than this. It was shot on location because all the big Hollywood pictures were shot in Italy in those days. 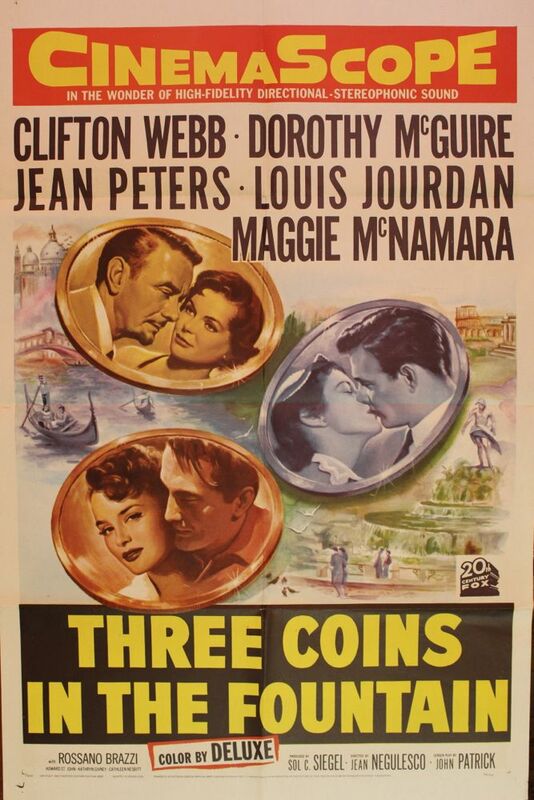 It seems to be a particularly fondly remembered example, but nobody seems to talk about much other than “shot on location” and “three American women in Rome wish for love”. It’s in color and CinemaScope, so the Italian views won’t be squandered. In fact, I get the impression they’re the best part of the movie for a lot of people. American Maria Williams arrives in Rome to replace the outgoing United States Distribution Agency secretary Anita Hutchins, as she is returning to America to marry. Anita, and now Maria, shares a spacious apartment with Miss Frances, secretary to American expat novelist John Frederick Shadwell. Showing Maria around town, the ladies stop at the Trevi Fountain, famous for granting romantic wishes, and Maria and Frances throw in coins. Orienting Maria at the Agency, Anita introduces her to Giorgio, one of the office’s native translators, and Maria can see immediately how smitten Giorgio is with Anita, though it is a strict Agency policy to forbid fraternization between American and Italian employees. Later, Maria meets Prince Dino di Cessi at a party and is charmed by him, though warned that he is one to claim women’s reputations and then move on. Over the weekend, Anita, who admits to Maria she isn’t going home to marry a man so much as find a (wealthy) man, begrudgingly accepts Giorgio’s invitation to an event at his family farm, and Maria is spurred on by Frances to accept an invitation to Venice from Dino, with Frances chaperoning. And with changes in store for both of her roommates, Frances finds herself wondering about her own future. There’s a very subtle distinction between an instigator and a catalyst. I thought Frances was an instigator without much of her own story, but then suddenly the third act becomes entirely her own story as the other two are put on hold for a considerable chunk of the movie until her plotline develops to the point that it can jump start the other two again. There’s no way around this structure without a considerable change to the plot, so it ends up being a slightly unbalanced mix of telling loosely connected concurrent stories and a collection of episodes. It’s an interesting, asymmetrical construction that isn’t classical and defied my expectations, but works in its own way. Of course, the reason why so many Hollywood productions were filmed on location in places like Italy in that time is doubtless because as the technology and art of cinematography had matured, pairing color and broad canvases with the sensibility to photograph them well, somebody realized that people would like to see moving pictures of beautiful places they might never get to personally visit, and not simply actors on stages. This was a good move, providing movies the opportunity to take a moment to look around, and giving stories a chance to be seen that might not have been if someone hadn’t noticed it could justify some exotic vistas. That’s not to say that spectacle can’t be a crutch, but I don’t think it was here. There’s one scene I particularly appreciated, and it’s what spurs Frances on to her own decision going into the third act. Losing her roommates and facing the prospect of living alone in the enormous apartment, she’s gifted with a kitten for companionship by the maid. She’s pleased to have him until the maid starts to talk about how the relative she got the kitten from has lived with just her cats for years and how dear the cats are to her. Old cat ladies are universal. It’s possibly in the running for best use of an animal as a plot motivator not counting animals wanting to eat the characters. Perhaps there could have been more done to maintain the throughlines of characters that aren’t active at certain parts of the film, but the overall structure doesn’t need to be changed, once one recognizes what it is. And they’re doing it on beautiful locations and telling love stories, which allows for some leniency. They manage to convey the relatability of the experience of American secretaries abroad, which is more important than the structure. Not everything has to be the highest art, as long as it can be enjoyed.